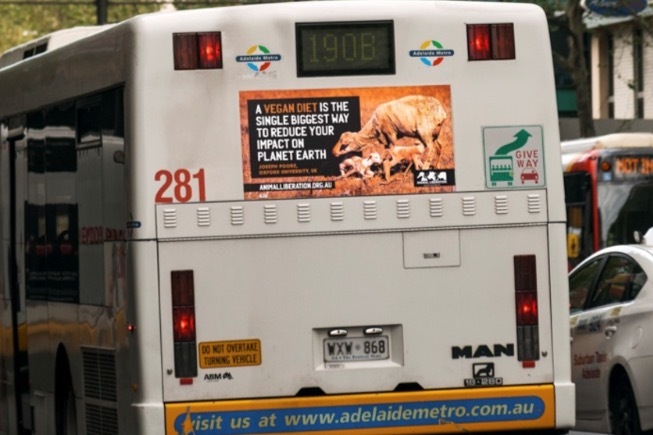 Animal Liberation SA has been running the bus campaign for a couple of months now. The advertisement is to encourage people to think about how their food choices affect the environment. Based on the Oxford study we think more people need to realise that there is no such thing as sustainable animal agriculture and that the most effective way to reduce your impact on planet earth is to go vegan. Bus advertising is extremely efficient at getting our vegan message out to the wider community. It is, however, quite expensive so we need all the financial help we can get. Help us save, not only the planet, but the animals by spreading our powerful message for as long as possible. Please note that Animal Lib SA is an entirely volunteer run organization and 100% of donations will go directly to this campaign.